A Consuming Passion: Back again - just in time for another Daring Baker's challenge! Back again - just in time for another Daring Baker's challenge! Hello! Its been ages I know. The last few months have been manic and the baking, I'm sad to say, has fallen by the wayside. 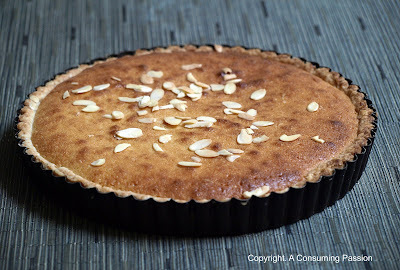 I've been slowly getting back into it and I've made it in time for the June Daring Baker's challenge - Bakewell tarts! Having lived in London for the past 2.5 years, I've seen Bakewell tarts in various shops and menus and have always known they are a classic English dessert. Surprisingly, though, my curiosity has never gotten the better of me and I've never actually tasted one! So, now seemed as good a time as any to give it a go. The recipe we were given was really easy to follow and I must say I was extremely happy with the way the tart turned out. It wasn't just that it was yummy, but I thought it looked quite good as well! Like something you could have bought in a store. Now I suppose whether this is a good or bad thing really depends on your perspective. M and I are always having little debates about this - he believes that home-baked goods should look slightly imperfect and that they were made at home while I, on the other hand, believe that they should look professionally made even when made at home. What do you think? Place the chilled dough disc on a lightly floured surface. If it's overly cold, you will need to let it become acclimatised for about 15 minutes before you roll it out. Flour the rolling pin and roll the pastry to 5mm (1/4”) thickness, by rolling in one direction only (start from the centre and roll away from you), and turning the disc a quarter turn after each roll. When the pastry is to the desired size and thickness, transfer it to the tart pan, press in and trim the excess dough. Patch any holes, fissures or tears with trimmed bits. Chill in the freezer for 15 minutes. Welcome back! Glad you were able to come back to an easy challenge. yum! i like the look of the almonds on top, perfect. I tend to buy professional looking things and make slightly rustic ones, but that might just be because of my failings in the kitchen :) Your tart looks just perfect! I found your food blog going through a few links. Glad I ran into it. Didn't know that the food blog community was so big. I love your posts! I was wondering if you would like to exchange links. I'll drop yours on my site and you drop mine on yours. Email at ramendays@yahoo.com or stop by my site and drop a comment. Let me know if you would like to do a link exchange. Hopefully you'll get back into doing more baking! Great job! Perfect tart you have, I also love tarts and wanted to taste this yummy one! Hip hop watches are the easiest way to add some bling bing to your outfit. The easiest method to display your success is through an urban watch. Everyone needs to know the time so why not adorn your arm with an iced out watch encrusted with various simulated diamonds. An iced out hip hop watch is hard to ignore. Urban hip hop watches generally feature oversized faces with dozens of sparkling diamonds encrusted throughout. An iced out urban watch speaks volumes about your social status and style. Why pay thousands of dollars for a real designer watch when you can get a whole collection of cheap bling watches simulated diamond hip hop watches for a fraction of the price. Our collection of hip hop urban watches includes styles and colors for all occasions. Our most popular hip hop watches are encrusted with multicolor simulated diamonds. Looks wonderful. Some colors would be more pleasant visually. Like this filipino recipe i found. looks great! I've seen this in a few magazines here and there and have yet to actually try one, I should give this it a go it looks wonderful! You're tart is beautiful! I've never heard of Bakewell Tart until now, thanks for educating me. How glorious! You totally had success. Wow this looks absolutely good and probably taste delicious. I can’t wait to try this at home. Wow your looking too good. I think you are really nice and beautiful. I like you and your blog post. I came across your site and liked it very much. This looks so tasty thanks for the recipe. I really enjoyed looking around your blog. You have a lot of tasty good recipes. Keep up the hard work. This recipe is very good. sweet and well balanced. I made a few changes just to suit my family's taste. Great comfort food. Looks absolutely fantastic! Lovely blog too. Good luck in the competition.